Welcome to Bark Busters Home Dog Training Banbury. My name is Emma and I’m your local dog behaviour therapist, and I'm here to help you with your general training needs or to resolve any behaviour issues that are causing you concern. These may be aggression to other dogs, or to people, sibling rivalry, separation anxiety, excessive barking, destructive behaviour, toileting, boisterousness, pulling on the lead, recall and much more, or even obsessive-compulsive disorder. I can also help with puppy education. These are one of my favourite lessons and helping new or experienced owners to understand and educate their new puppy. Somehow, I manage to spend some of the time cuddling puppies too. I’ve loved dogs since I was a child and I craved to own one of my own, but that wasn’t possible until I was independent in my 20’s. I became very interested in dog psychology and read and researched as much as I could. This helped me train my own dogs, my first being a lovely easy to train Labrador (they’re not all like that though). Since then I’ve shared my life with various working breeds like Spaniels and Labradors. One of them I trained as a gun dog and we had wonderful times together, whilst working, and on recreational walks together. I, like most people had to work for a living and was in a less than rewarding corporate role. So, to enjoy a more enjoyable work/life balance I qualified as a dog groomer. 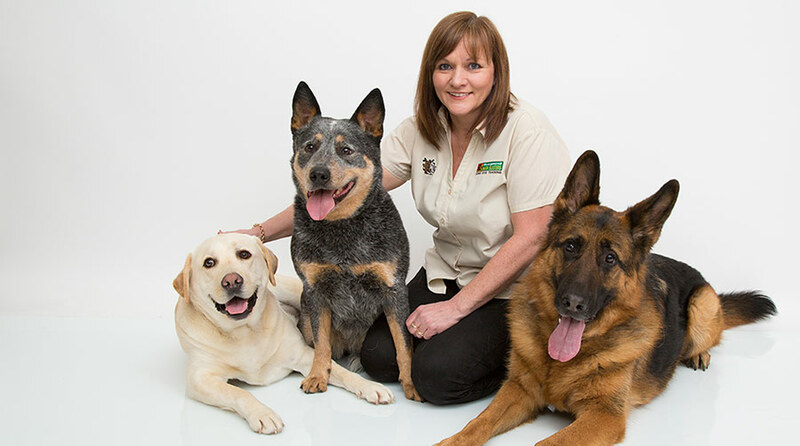 I really enjoyed my work and the knowledge I’d gained from my dog psychology studies helped enormously when dealing with nervous, anxious dogs that may be aggressive in their fear, or dogs new to being groomed and lacking in confidence. Sometimes their owners would tell me about other issues they were having and following tips on what might be triggering the behaviour and providing suggestions of ways to help. I was delighted when they happily reported back that it’d worked! Gradually, the idea of becoming a dog behaviour therapist and trainer took hold and I started to look around for suitable ways to train and qualify. An internet search mainly showed correspondence or internet only courses, but then I found Bark Busters which had intensive dog handling and training right from the start. This suited me perfectly and I now help dog owners in and around the Banbury region. The Bark Busters training is based on the way that dogs naturally communicate, using voice tone and body language. I'd been trying for some time to sort out a rather long running issue I had with Tammy, my Cockerpoo, who being extremely clever, had started to steal and guard items to get my attention. It wasn’t long before I’d managed to calmly and quietly change her behaviour with training games to challenge her quick brain and reward her new-found excellent behaviour. She is now 7 years old and a fantastic companion. My training is one-to-one and conducted in your home and outside on walks, where you and your dog are less stressed, most relaxed, and where you can take the time to focus on your dog without distractions. I come to you at a time that suits you and we work together to resolve those unwanted behaviours that are causing you problems and maybe putting strain on your relationship with your dog; and possibly with other members of your family too. I work with any dog big, small or in-between with any behavioural issue, plus puppies of course. Naturally, we concentrate on the major issues, using a dog’s own body language. I assess the personality and make sure I tailor-make the training to make it fun for both dog and owner. I explain how your dog perceives the world, and the reasons behind the behaviour problems. I show and guide dog owners how to carry out the training programme and ensure that they and their dog are happy with the results from our very first lesson. You will be left with written instruction, information sheets and tips to help you to consolidate what you have learned, and our written Support Guarantee will give you peace of mind that I will return, free of charge, to support and guide you through the term that you have purchased. You can feel confident knowing that I am only a phone call or an email away from continuing to help you if you struggle. 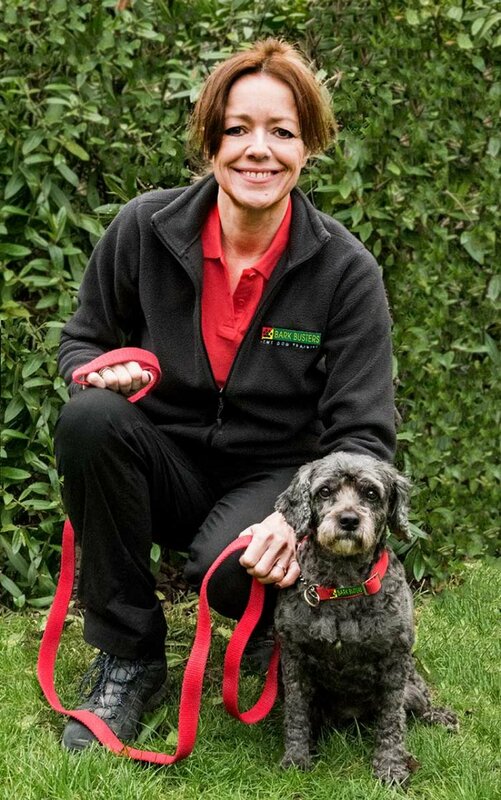 I’d love to help you find a way towards a better relationship with your dog so please do give me a call on 0808 100 4071 or simply click the red button above, to book your training, and I’m looking forward to meeting you very soon.